The Houston Astros visit Safeco Field on Wednesday, September 6, 2017 to play the Seattle Mariners. The probable starters are Lance McCullers for the Astros and Mike Leake for the Mariners. The opening line for this matchup has Houston at -140 and Seattle at +130. The Astros have a 69-59-9 over/under record and a 72-65-0 run line mark. The Mariners are 62-76-0 against the run line and have a 67-66-5 over/under record. The Astros have a 84-53 overall record this season. Starting pitcher Lance McCullers has a 7-3 record with an earned run average of 3.92 and a WHIP of 1.29. He has 118 strikeouts over his 105.2 innings pitched and he's given up 100 hits. He allows 8.5 hits per 9 innings and he has a FIP of 2.95. The bullpen has an earned run average of 4.11 and they have given up 405 base hits on the year. Teams are hitting .228 against the bullpen and they've struck out 569 hitters and walked 179 batters. As a team, Houston allows 8.2 hits per nine innings while striking out 9.9 batters per nine innings. They are 11th in the league in team earned run average at 4.14. The Astros pitchers collectively have given up 1,120 base hits and 564 earned runs. They have allowed 159 home runs this season, ranking them 23rd in the league. Houston as a pitching staff has walked 451 batters and struck out 1,351. They have walked 3.3 men per 9 innings while striking out 9.9 per 9. They have a team WHIP of 1.28 and their FIP as a unit is 3.87. As a team Houston is hitting .285, good for 1st in the league. The Astros hold a .485 team slugging percentage and an on-base percentage of .348, which is good for 1st in baseball. They rank 1st in MLB with 9.9 hits per game. Jose Altuve is hitting .354 with an on-base percentage of .415. He has 183 hits this season in 517 at bats with 72 runs batted in. He has a slugging percentage of .561 and an OPS+ of 168. Josh Reddick is hitting .310 this year and he has an on-base percentage of .353. He has totaled 133 hits and he has driven in 74 men in 429 at bats. His OPS+ is 127 while his slugging percentage is at .473. The Astros have 1,360 hits, including 287 doubles and 210 home runs. Houston has walked 428 times so far this season and they have struck out 916 times as a unit. They have left 935 men on base and have a team OPS of .834. They score 5.58 runs per contest and have scored a total of 765 runs this year. Seattle has a 69-69 overall mark this year. With an earned run average of 4.14, Mike Leake has a 8-12 record and a 1.32 WHIP. He has 110 strikeouts over the 161 innings he's pitched. He's also given up 177 hits. He allows 9.9 hits per nine innings and his FIP stands at 4.1. The bullpen has an earned run average of 4.01 and they have given up 445 base hits on the year. Teams are hitting .241 against the Mariners bullpen. Their relievers have struck out 453 batters and walked 186 opposing hitters. As a team, Seattle allows 8.8 hits per nine innings while striking out 7.7 batters per nine innings. They are 16th in the league in team earned run average at 4.5. The Mariners pitchers as a team have surrendered 1,204 base knocks and 615 earned runs this season. They have given up 210 home runs this year, which ranks 2nd in Major League Baseball. Seattle as a staff has walked 434 hitters and struck out 1,048 batters. They give up a walk 3.2 times per 9 innings while they strike out 7.7 per 9. Their team WHIP is 1.33 while their FIP as a staff is 4.83. As a team, they are batting .259, good for 12th in the league. The Mariners hold a .418 team slugging percentage and an on-base percentage of .326, which is good for 16th in baseball. They rank 11th in MLB with 8.9 hits per contest. Nelson Cruz comes into this matchup batting .283 with an OBP of .370. He has 132 hits this year along with 104 RBI in 467 AB's. He maintains a slugging percentage of .535 with an OPS+ of 140. Robinson Cano is hitting .276 this season and he has an OBP of .335. He has collected 137 hits in 497 at bats while driving in 84 runs. He has an OPS+ of 111 and a slugging percentage of .459. The Mariners as a unit have 1,224 base hits, including 246 doubles and 160 homers. Seattle has walked 418 times this year and they have struck out on 1,079 occasions. They have had 932 men left on base and have an OPS of .745. They have scored 4.65 runs per game and totaled 642 runs this season. 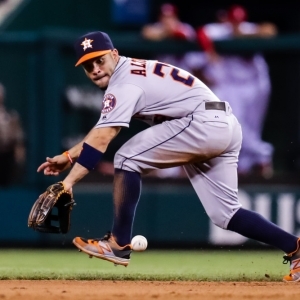 Who will win tonight's Astros/Mariners MLB game against the spread?